It became apparent quite early in the project that batteries for the mountain wheelchair would need considerable research. In a previous post I estimated that the wheelchair would need a 3 tonne battery to get up the mountain. Luckily, the project has come a long way since then. 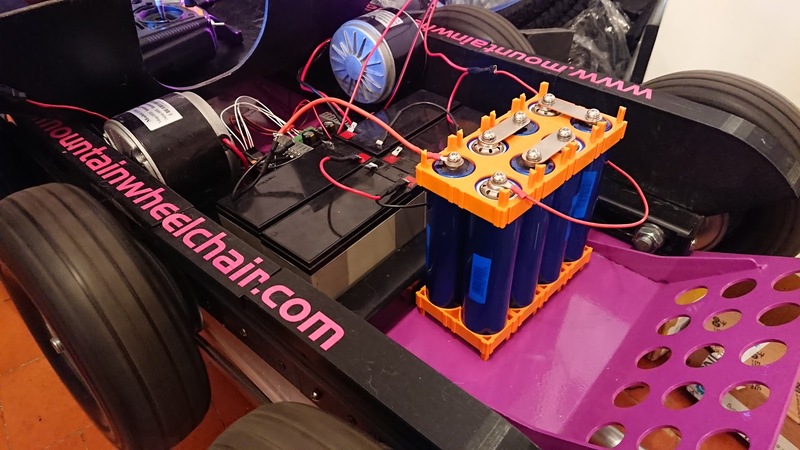 When I built the first test platform for the mountain wheelchair I decided to use lead acid batteries (think car battery). This was partly because I’m already familiar this technology, and partly because they’re inexpensive; the four batteries on this prototype were £20 each. The problem with lead-acid batteries is that (1) they’re heavy, and (2) the way their voltage drops over time isn’t particularly useful. Take a look at the blue line in the graphic below, this shows how a lead acid battery’s voltage drops over time. If you imagine for a moment that this battery is powering a wheelchair motor, then you would expect that over time the battery’s voltage would drop. In fact, looking at the blue line for the Lead Acid battery, you can see that the voltage drops in quite a linear fashion, so there’s nothing really surprising here. Batteries discharge as you use them right? The problem with this is that the power available to the motor steadily gets weaker and weaker over time. On the mountain wheelchair, it would mean you’ve got lots of power to begin with, but as soon as you start driving, the available power drops in a linear fashion. Half way up the mountain you can no longer get over the same obstacles which you could at the start. Now take a look at the red line on the graphic above, this represents LiFePo4 batteries. As you can see, the LiFePo4 batteries lose power in a far less linear fashion; they maintain a constant, high voltage for a long period of time and then quickly drop off at the end. This is great for the the mountain wheelchair because it means that you’d have fairly constant power for the duration of the trip. If you managed to drive over a boulder near the foot of the mountain, chances are you’d be able to drive over a similar boulder on the summit. Not only this, but LiFePo4 batteries are also typically half the weight of lead acid batteries, so not only do you have more usable power, but you also won’t need as much power because the wheelchair will be lighter. The other main advantage of LiFePo4 is the amount of power (current) they can provide in a single burst. If the motors needed a sudden boost of power to get the wheelchair over a particularly large step, LiFePo4 batteries would be more capable of supplying that boost than lead-acid. The two main disadvantages of LiFePo4 batteries though are their price and the additional care needed to look after them. In the prototype shown above I had four 12v 7ah batteries. These batteries were wired together to give me a total of 24v 14ah. In total this cost £80. LiFePo4 batteries only provide 3.2v. So to make up 24v, you need 8 batteries. The cheapest I’ve been able to find suitable LiFePo4 batteries in the UK is £23.45 each. Multiplied by 8 this is £187.60 for 24v (More than twice as much as the lead acid batteries). That being said, LiFePo4 are good for 2,000 cycles (fully drained and recharged again), whereas lead acid has a maximum of 300 cycles. In the long run then, LiFePo4 might prove to be more cost effective as they won’t need replacing as often. As you can see, these batteries are worth the premium and not too long ago these 15ah cells arrived in the post. Shiny! As I said above, the other problem with LiFePo4 batteries is the additional care required. Batteries can catch fire. I imagine it would be a terrifying thing to see somebody in a wheelchair engulfed in flame part way up a mountain. One of the reasons they catch fire is because there are lots of individual battery cells all working together. If one battery fails, then all the other batteries will keep putting demands on the failed battery until it expands, pops, and eventually has the potential to ignite. The way to avoid this is to make sure that all of the batteries are well matched. This doesn’t mean just buying batteries with the same specification though, as over time each one will deteriorate at a different rate to the others. There is conflicting information on the internet regarding how to make sure all of your batteries are well matched – LiFePo4 is a relatively new technology and many opinions are based on previous experience with lead-acid batteries. One method is to use a BMS (Battery Management System). A BMS monitors the state of every individual battery. If one battery runs flat, the BMS will stop the vehicle. The problem with LiFePo4 batteries, as can be seen in the graph above, is that when the voltage of your weakest battery does drop, it will drop quickly. If your BMS isn’t fast enough, kaboom! The other problem with this is that you have to prematurely stop the wheelchair just because of one weak battery cell. A better solution is battery balancing. Top balancing means charging each individual cell as much as possible until they all have the same voltage. Bottom balancing seems to be the best option for LiFePo4 cells though. 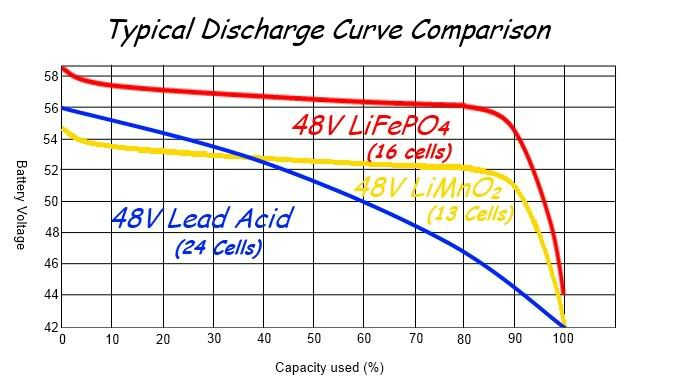 Instead of trying to balance the cells by forcing them to a certain voltage, in bottom balancing you drain the LiFePo4 cells until they’re in the steep downwards part of the discharge curve (Usually about 2.75 volts). As I write this post, I have my LiFePo4 cells wired up to two motors which have been left to run. There are 8 cells in total and I want to get them down to about 3.1v each to begin with. 8 x 3.1 = 24.8. Once the pack reaches 24.8v, I will begin to discharge the cells individually until the each have 2.75v. The cells then need to be left for 24 hours for their voltage to stabilise. At which time, it might mean charging or discharging them a little more, until they are all within a +-0.001v tolerance. Once all cells have stabilised at 2.75v, I will wire all of the individual battery cells together, and charge them as one unit, as if it were a single battery. Before I can do this though, I need to buy another 8 cells (to give me 48v in total), and a 48v battery charger. With all 16 cells at 2.75v, then wired together in series, I will use the 48v charger to bring them all back up to almost maximum capacity. Maximum capacity for these cells is 3.6v, however, I’ll only bring them up to 3.55v in order to give them a little room to breathe. For all 16 cells, this will be 56.8v in total, and should be plenty enough to get the wheelchair into the mountains. *Update* See the modification I made to the battery charger. Once they’ve been charged, they need to remain in their pack. All cells should be discharged and recharged together. If for some reason you disconnect one of the cells, then you will need to go through the whole bottom balancing process again. How much power will the mountain wheelchair have? The current design for the wheelchair will accommodate a maximum of 112 x 15ah LiFePo4 cells. To make 48v, I need 16 cells. If I then divide 112 by 16, this gives me 7 x 48v battery packs. If each of these packs has 15ah, then this gives me a total battery capacity of 105ah (7 x 15). I don’t know how many amp/hours the mountain wheelchair will need. Some people have said that 105ah is far too much, others have said it won’t be enough. As I don’t have the mathematical ability to calculate this figure for myself (although I have attempted it here), and I seem to get conflicting opinions depending on who I ask, my plan is start off with one 16cell 48v pack which gives me 15ah. I’ll see how I get on with this and then add more packs as required. It makes sense to start off with as little as possible, not just because it makes for a lighter wheelchair, but also because each 48v battery pack costs nearly £400! If I use up the available space on the mountain wheelchair and have 112 cells to give me 105ah, then I will have spent £2,626.40 just on batteries. 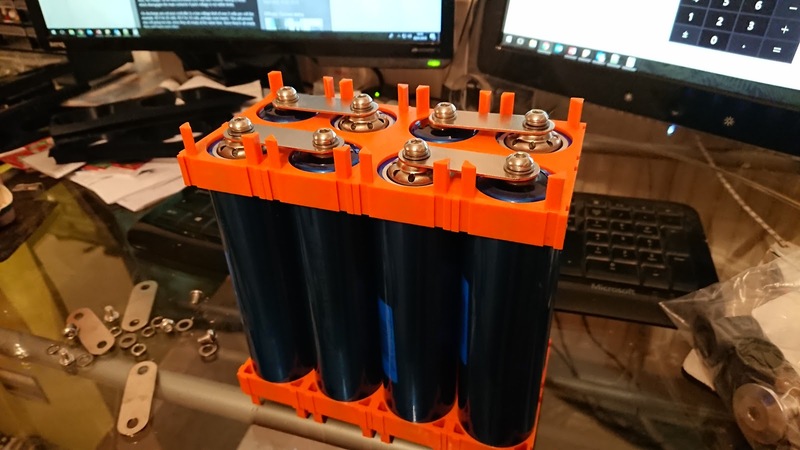 The other 8 batteries have been ordered, along with a 48v battery charger and a single cell 3.65v charger. When they arrive I’ll get the whole pack balanced. The hub motors have been posted and are currently en-route from Cina. One of my next tasks will be to invest in some motor controllers so that when the motors arrive, I can begin testing the electronics.